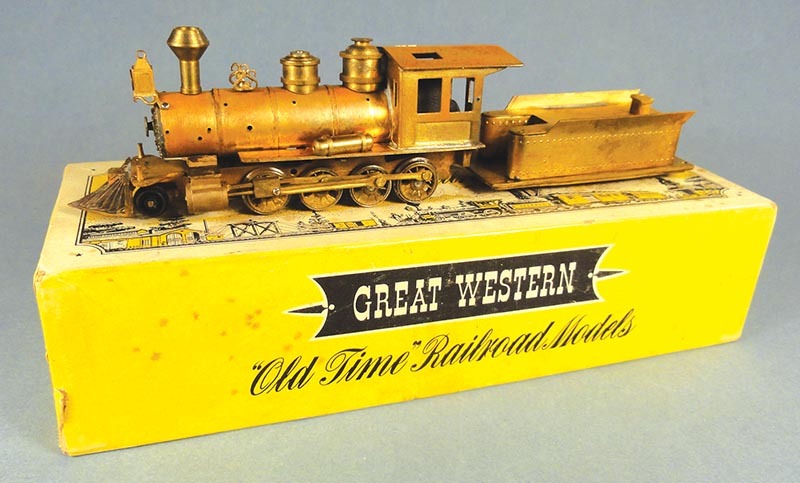 This HO gauge “Brass Betsy” was started by the late Bill Coffey. Its drivers are bound up, which is probably the reason Bill never ﬁnished the model. Another friend of mine assembled one of these kits when we were both in high school, and he and I spent many hours of our adolescent years trying to make the locomotive run. I want to “ramble” in this issue by telling two tales. First, I will briefly describe a pioneer model manufacturer, and second, I will tell how I became acquainted with this company’s models on a friend’s layout, some 70 years ago. I first saw ads for Great Western Model Locomotives (GWML) in the 1948 issues of Model Railroader. GWML had taken an ad in each issue through that year. Some were quarter-page with a nice photo, but some were tiny ads with just an address. GWML was founded by George Miller, and was located in North Hollywood, Calif. The company sold kits for O gauge old-time locomotives and cars. They listed: a 0-4-2 saddle tank, a 4-4-0, a 2-6-0, and a large 2-8-0. The parts for these locomotives consisted of folded and machined brass, brass wire, handrail stanchions, and white metal couplers and trucks. Many of the brass parts had to be soldered together. The instructions were like blueprints, and there were typed pages of suggestions for assembly. Cars included: a baggage car, a combine and coach, a Russell log car (complete with logs), a Union Line tank car, an N&W flatcar, an N&W low side gondola, and a C&NW hopper car. 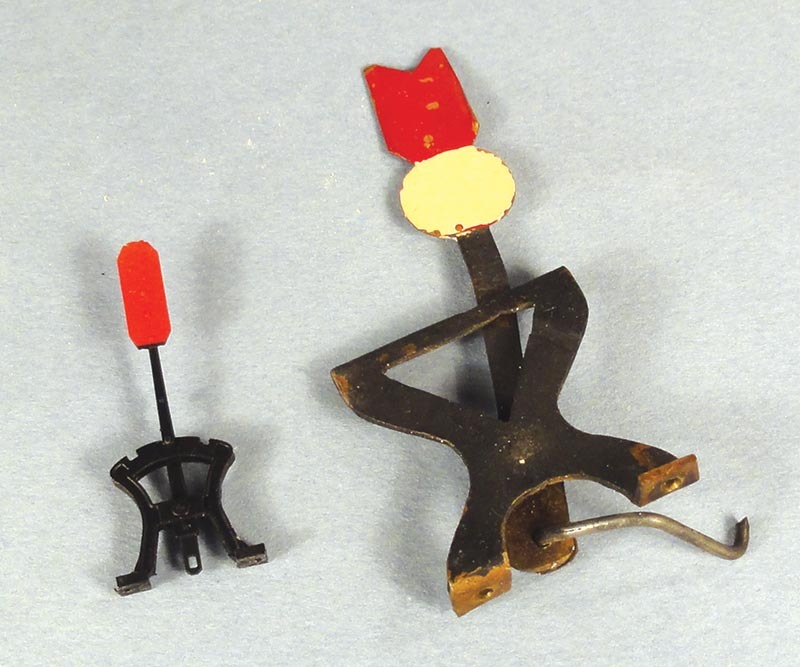 These kits consisted of pre-cut wood and cardboard parts with metal details – and were crude by today’s standards. They were different from O gauge cars of the period be-cause the wheels were only 24 scale inches in diameter, rather than the more standard scale 33-inch diameter wheels. The arch-bar trucks were small and “old timey,” and the kits’ instructions suggested making the cars “swaybacked.” Later, GWML sold HO gauge, old-time 2-8-0 kits for “The Brass Betsy,” and even later, an HO scale gallows turntable. This O gauge, Great Western Model Locomotives’ 2-6-0 needs to be completed. I am not sure whether its stack or tender trucks are original. I plan to donate these GWML models to the NMRA’s exhibit “The Magic of Scale Model Railroads” at the California State Railroad Museum in Sacramento. Charlie Getz and I, along with many others, are designing and supervising this exhibit. We are looking for donations of pre-war kits, and models – especially Varney. (All tax deductible.) Please contact me at if you have something you would like to donate. Around 1948, I met a local model railroader named Joe Moore. He was a Marine veteran, who had fought in the Pacific during Word War II, and lived with his wife and 10-year-old son in a tract house with a detached two-car garage in East Palo Alto, just across the Bay Shore Freeway from my home in Palo Alto. Joe was building an O gauge lay-out in his garage, and I remember bicycling to Joe’s house many times, and returning late at night across the overpass above the freeway. Joe had built a plywood table covering half his garage, and left the other half open for his automobile. The plywood table had pop-up holes so he could reach his models. Lots of ducking! An O gauge loop of Tru-Scale roadbed circled the entire garage, with a removable section that allowed Joe to park his car. A track led off this loop to the plywood table. For those of you not familiar with Tru-Scale roadbed, it has ties milled into a soft pine roadbed. The ties have milled-on tie-plates. You drop Code 172 rail between the tie-plates, and spike the rail down. It was easy to spike into the soft pine, and you would end up with accurate, and easy to lay track. In my youth, I spent many hours spiking down Code 100 rail to HO gauge Tru-Scale roadbed, and I still use pieces of Tru-Scale roadbed to lay out the track on my On3 layout. One of Joe Moore’s handmade, oversize, working, harp switch stands, next to a contemporary O scale harp stand. Joe’s may have been crude, but there were no commercial harp stands in his day, and his switch stands worked perfectly. However, Joe decided not to use Tru-Scale roadbed on his plywood table, because he wanted to model the old-time, light track of the Virginia & Truckee Railroad. So, he hand-spiked Code 125 rail onto individual wood ties, which were glued down on the plywood with no insulation. Driving the spikes through ties into the hard plywood must have caused many blisters. Joe was modeling the V&T’s Carson City engine facilities with the turntable and massive stone engine house. I remember Joe had a model of the V&T’s rectangular water tank with spouts at each end, to serve two tracks at the same time. Joe made his own stub turnouts from Code 125 rail, and fabricated his own harp switch stands from sheet copper. Somehow, I acquired several of these harp stands. They were designed to throw turnouts, and were “man-sized.” Each was about 20 scale feet tall, and was easily grasped to throw a turnout. It was satisfying to use Joe’s harp switch stands – sort of like throwing a prototype harp stand. Joe had purchased, and assembled, Great Western Model Locomotives’ kits for the 4-4-0, 2-6-0, and 2-8-0. How I envied him! I could never have afforded even one of those locomotives. Joe had painted the boilers blue to represent Russia Iron, and the cabs, cylinders, domes, pilots, and tender tanks a nice bright red. Just like “old-time” locomotives should look. Alas, Joe’s layout did not run well, and was noisy because the track was laid directly on plywood. Later, Joe bought several of my O gauge models, so I would have some cash to court Irene. After I went into the Navy, I lost touch with Joe, but heard that after he retired from American Express, he moved to Nevada, and worked on the reconstruction of his favorite railroad, the Virginia & Truckee, into Virginia City, Nevada.